Although police horses have been put back into service since 1996, there was a long period of time when they were removed from service. That happened in 1936 as this Milwaukee Journal article tells. The horse patrols actually managed to survive another 12 years after a referendum allowed them to stay. See the Milwaukee Police Mounted Patrol website for more pictures, including a better one of the picture shown in the newspaper below. 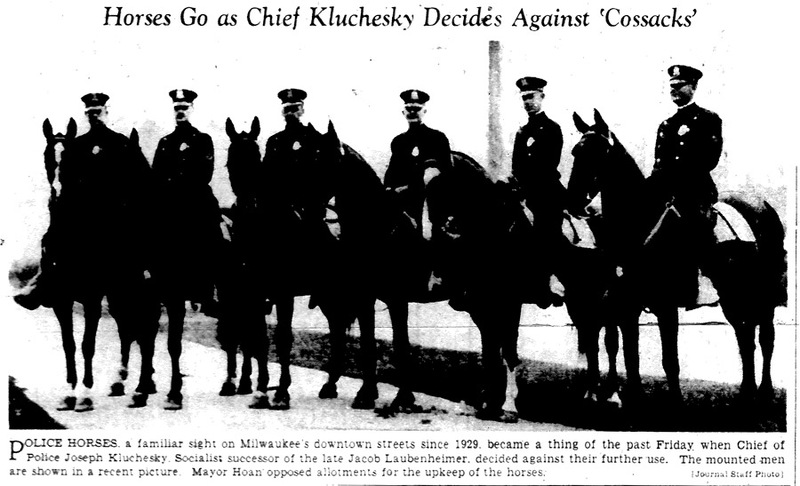 Attachments built up between Milwaukee’s mounted police officers and their mounts — Tom, Buster, Jerry, Lucky, Buddy and Jerry — were broken Friday by the sudden order discontinuing mounted police. The hordes went back to their stables at 1226 N. Fourth st. and the officers, Warren Fidlin, William Huebner, George Williams, Domonic Ozzello, Elmer Fischer, Joseph Botton and Clement Stapleford, went back to traffic duty on foot. The change was so sudden that the officers couldn’t say a word. They wouldn’t have said anything anyway, under the rules of discipline. But the order brought pangs in parting with their dumb friends. To hundreds of persons who pass through the busy downtown district the absence of the police horses will mean the loss of friends. Folks used to stop to pat the horses and feed them a lump of sugar or a carrot. What other kind of work the horses could do is a problem, for they are more at home among clanking street cars, rumbling trucks, busy automobile traffic and hurrying crowds than in a field of green grass. The intelligence and devotion of the horses have been a source of never ending wonder to downtown crowds. When an officer dismounted to make an arrest or do some other bit of routine police work the horse would stand quietly at the curb. In the years they have been on the streets only one black mark has been written against the six. One horse bit a boy, according to a complaint now before the courts. Bud, 14, oldest horse of the six, once gave an example of devotion to duty. Williams, the rider, was riding west on Wisconsin av. at noon and the horse was headed for his noonday oats. At the Plankinton building there was a cry about a pickpocket and Williams hurried into the building. He came back to the curb half an hour later, expecting that the horse had followed tht routine lunch time trip, but there stood Bud, patiently waiting. Buster, Huebner’s mount, is a strictly “one-man” horse. He was slow to make friends and stood indifferent as persons stopped to pat him. When an old friend would approach from Commission Row with a tasty carrot or bite of apple his ears quickly stood up in recognition. Buster had a sweet tooth, too. There was a candy factory on bis beat and when he got hungry he would saunter in that direction as a hint to Huebner. Tom, an 11-year-old, was the mischievous fellow of the lot. Once he reached over and took a parcel in his mouth from a woman shopper. He lifted his head out of reach and seemed to enjoy teasing the woman. When Fidlin scolded him he gave the package back with hasty meekness. Jerry was the beggar. If a person approached he would scent a lump of sugar or piece of candy and gently nudge the prospective giver. He frequently lifted his front foot as if to shake hands. After tracking one of the women by the marks of her bare feet in an underground passage and pursuing a man up a dark alley, Detectives Hartman and Stout succeeded in apprehending all of the inmates of an alleged disorderly house at 604 Edison Street last night. When Julia Washington, 30 years old, colored, alleged keeper of the place heard one of the officers ascending the front steps, she sought safety by fleeing into the cellar and entering an adjoining building through an underground tunnel. After tracking the footsteps in the dust in the passage, the detective found his quarry hiding under a bed in the building next door, according to testimony. Joseph Woligarski, 18 years old, alleged inmate, is said to have made his escape by climbing through a back window, sliding out on the long porch and dropping into the alley. He was seized by the other detective who had stationed himself in the back yard. Julia Washington was fined $25 and costs by Judge Page, Woligarski was let off with a reprimand and Lulu Williams, alleged inmate, was fined $10 and costs. One hundred and twentythree prisoners, the largest number ever appearing in court in a day in the history of Milwaukee, were arraigned before Judge Page. Seventy persons were charged with being drunk and disorderly. Judge Page held the blame for the immorality wave at the door of the election, holding that discussions of candidates are prone to make men thirsty, and that thirst is the one great factor in the downfall of the over-zealous voter. About 500 people appeared in court as witnesses. The consultation room had to be used as a temporary “bullpen” to accommodate the prisoners awaiting trial and “coppers’ row” had a sky blue tint which came from sixty “cops” squeezing into a gallery that was made to hold that number. Johann Lembeisser was tried for being drunk. At this point Deputy Fitzgerald interfered and led the gifted orator away, but not before the man had been rewarded by a deafening round of applause. Strange stories from the police blotter one hundred years ago. Michael Tornic, 4104 Grand-av, arrested as the result of statements made by Mary Reonlaka, 15, in juvenile court, was found not guilty in district court, Monday. Walter Austin, 45, was standing on Kinnickinnic-av, Sunday night, when a man passed, carrying three jugs of whiskey. The bearer of the jugs accosted Austin and the two sat down upon the sidewalk. “I am going to West Allis,” said the man with the whiskey. “Will you go with me?” “I’ll go anywhere with a man who has three jugs of whiskey,” declared Austin. 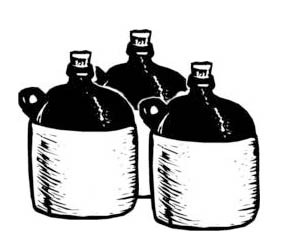 The three empty jugs were used as evidence against Austin, Monday, when he was fined $5 and costs. Neither Calvin Whittington nor William E. Hunt, who engaged in a fist fight in front of the Plankinton, Saturday night, while Miss Ruth Gwendolyn Shaw, said to be a Chicago heiress, acted as referee, appeared in the district court, Monday, when their names were called. 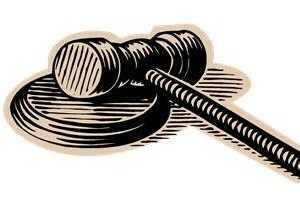 Judge Neelen fined each $1. For raising a disturbance and using profane language on a street car on Eighth-av and Mitchell-st, Sunday night, Joseph Klutz, 25, was fined $25 and costs Monday.